I recently had the chance to catch up with the largest Kubota dealer in Australia and was invited to the new premises out in the Western Suburbs of Sydney, where I learned a lot on just what makes a successful dealer/distributor, and that experience accounts for everything. When you are setting up a business there a few things that you really need to consider. You want to make sure you have a great product, you want to have market knowledge, you want to have marketing experience and have the best personnel to come with you on your journey, and you will need to combine all of these in providing your clients the best outcome and choices. 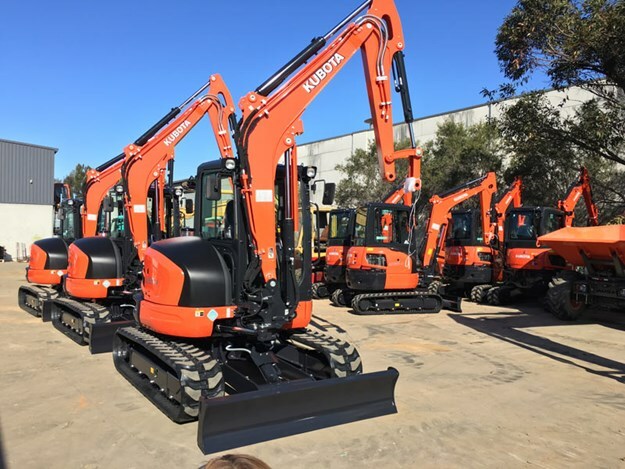 Australian Hammer Supplies (Bruce Pennels) has his family-run operations well and truly sorted by leading the way in Australia with five Kubota dealerships and being the largest seller of the Kubota range of excavators in the country. 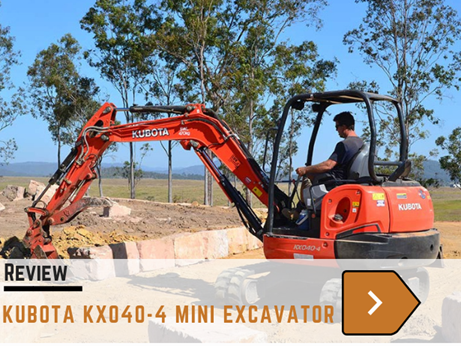 Balancing out the dealership based out of Ingleburn is Australian Hammer Supplies, Australian Bucket Supplies and Hire (excavators and hammers) and now the importer of Kato excavators. On the day we arrived the place was abuzz with deliveries coming in and sold tractors on the way out. We knew it was going to be difficult to get everything we wanted, but hey, you can’t stop progress for a couple of shots of some diggers. We were thrown a Kubota key and told to go find something that may be of interest to the readers. Now, when you are in that position, it becomes difficult to choose and with so much activity in the yard it made it more difficult to get some free time and space to get the machine of choice. Convenience was the determining factor of what machine to get hold of. Hot off the press – or should I say hot of the wharf – we hijacked a brand new Kubota U55-4 mini excavator as it came out of the delivery container. You won’t get newer than that! The Kubota U55-4 is a 5.5-tonne close radius tail swing excavator designed for those tight space entry points we all encounter at some stage in our excavator orientated careers. 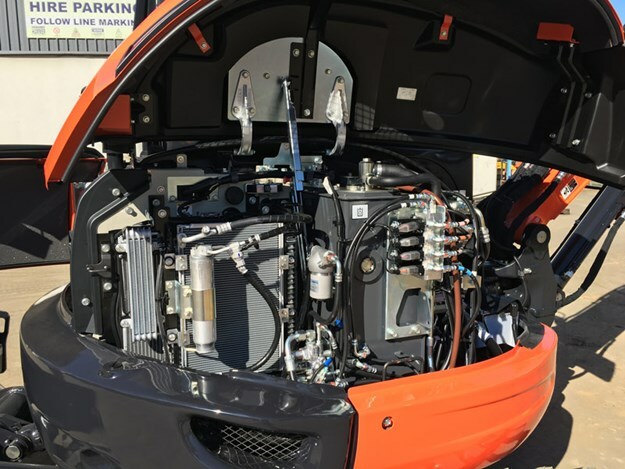 Kubota are running the direct injected 47hp (35kW) Kubota diesel engine which provides ample power and economy for this well balanced little digger. 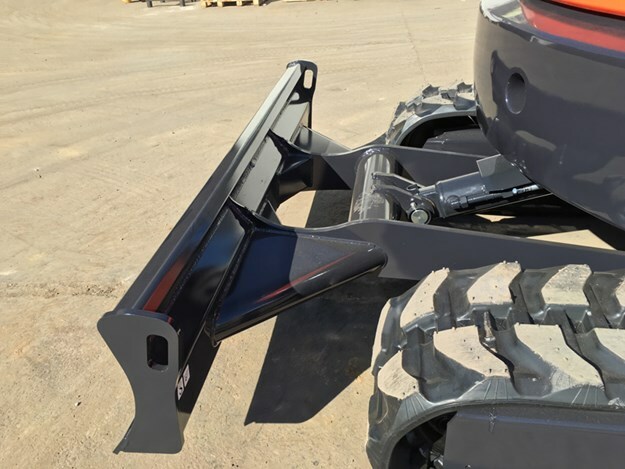 Swinging the rear engine and lifting the hydraulic cowling exposes just how the Kubota engineers have created this technically advanced and well-designed 5.5-tonner. The compact nature and precision gone into creating such a powerful machine with its engine and hydraulics squeezed into such a small area (yet extremely accessible) should anything go awry is nothing short of brilliant. When it comes to the hydraulics, flow rates for up to five hydraulic attachments can be programmed into the dashboard monitor memory and all controlled by the operator with the pressing of a button. Combine this with the factory fitted twin hydraulic auxiliary lines and you are bound to have a good day at the office. Kubota has a three-pump hydraulic system, which ensures smooth operation at all times and under all conditions, an increased travel speed in both low and high speed, and an automatic refuelling monitor to avoid spillage. Add a generous toolbox and grease gun holder, and Kubota have got the operator so spoiled he won’t want to go home to his missus! However, if he is still contemplating leaving work after a mere 10 hours, throw in the hydraulic angle blade positioner as well as the 80-70 degree side slew and that just might be enough to have a night shift coming on. It is "optional", but if I was in the market for a digger of this size I could not go past ordering the hydraulic angle blade. 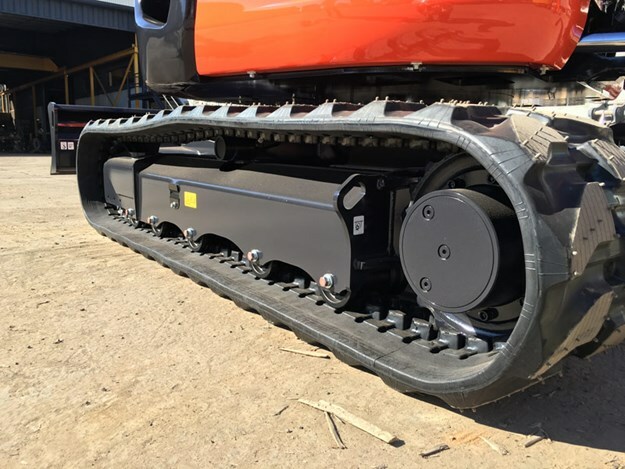 Designed to minimise track movements in backfilling (thus saving on track wear) it can move up to 25 degrees left or right and would be well worth the upfront money spent. The machine comes with some luxury updates and the neat non-conventionally shaped dashboard monitor sets the standard the minute you put your bum in the seat. Prompted icons abound and it is quite easy to work through them to put the operator in the picture of how the machine is running. Kubota have inserted into the blade lever control arm the two-speed travel switch, which makes the operation very fluent and much smoother for finer control whilst you are on the move. The seating is an ultra-comfortable and newer design, vision all round is excellent, mirrors and arm rests are well positioned, and the air-conditioning, radio and seat belts basically round out the cab. 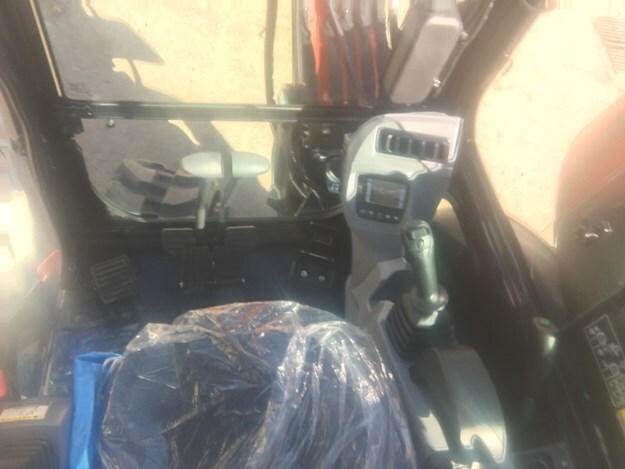 Worthy of mention is that under the seat there is a control lever that enables the operator to change between SAE and ISO control whilst in the cab. Well we can’t give you an "on the job" description as we hijacked the machine out of the container from Sydney wharf as soon as the machine reached Australian Hammer Supplies’ yard. No bucket, no pre-delivery, covered in plastic and merely thrown a Kubota key and left to our own devises to go and get something of interest. Well, we done it and there aren’t many opportunities to pull one off the wharf and bring the story to you – I hope you enjoyed it. The reputation for Kubota speaks for itself. The most popular mini excavator range in Australia by far, the best dealer in the country, the most market-knowledgeable bloke running the show and the best crew supporting the best product … you just don’t get any better. Being in the game at all levels for more than 40 years; you could almost say that Bruce has got his act together – and what a show. 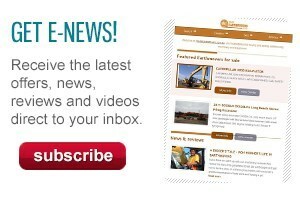 There is no doubt that Australian Hammer Supplies has come a long way since the Silverwater days of supplying hydraulic hammers of all makes and sizes, as well as servicing them for the NSW construction industry. It is now one of five new dealerships where it distributes the Kubota brand of excavators, skid steer loaders, tractors, mowers and everything branded Kubota. Add to this the Kato dealership, sales of Ausa 4WD site tippers, hydraulic attachments of all types and brands, supply of wear parts or ground engaging tools, a hire fleet of excavators with hydraulic attachments, Australian Bucket Supplies and Australian Hammer Supplies and Hire, and you have a one-stop shop right on your doorstep. 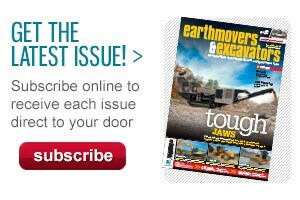 There is a reason why this is the largest Kubota excavator sales distributor in Australia. Great leadership, astute business decision making, great direction, and an owner who knows his strengths and has the best personnel in place at all levels to help him on his journey to providing the very best products, best service and best deals for his clients. Simple: best product, best service, best people. Kubota ticks all the boxes for me.